Where Did all the Hummingbirds Go? No one really knows for certain what triggers migration. Migration timing and direction are instinctive, and young hummingbirds start their journey without adult guidance. North American hummingbirds migrate in fall and winter to warmer regions in the southern portions of the United States, Mexico, Central America, and South America. In the spring they fly north where they can find more abundant food supplies and less competition for nesting sites. Migration allows the hungry hummingbirds to always have an ample supply of nectar. In essences they migrate to stay alive. As seasons change, these hungry little beauties have learned that they must travel to find the fuel that feeds them. The Pacific Flyway that runs through Placer Co., is also known as the “Floral Highway”. This highway is actually a corridor of changing habitats that meet the criteria for feeding and resting that all migrating hummingbirds need. As these little jewels move up and down the Pacific Flyway following the plants that bloom sequentially, they help pollinate the flowers and plants that feed them. Without this process there would a lot fewer plants species. This process is known as cross-fertilization, and ensures that there is a random mixing of genetic material, which in turn means healthier plants and flowers. 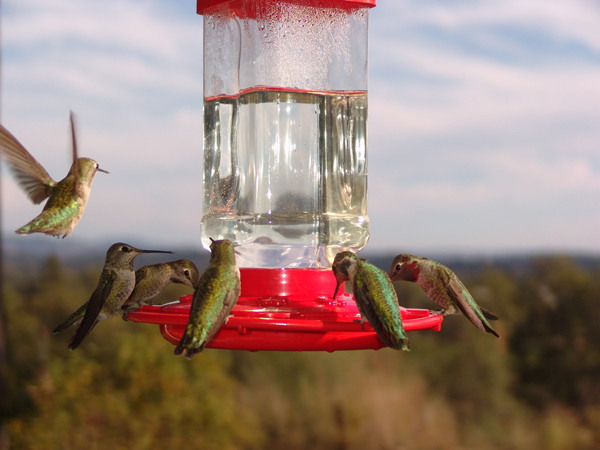 The urge to migrate is also accompanied by an increased appetite, and watching these hungry little hummers swarm a feeder in preparation for leaving is an incredible sight. They literally swarm the feeder and gorge themselves. They are storing fat for energy, and a well prepared hummingbird may double its weight just prior to migrating. They store this fat in deposits below the skin, and in the abdominal cavity. In Placer Couny, California we are blessed to have hummingbirds that stick around all year. There are a few hardy Anna's Hummingbirds that manage to ride out the cold months that we have. Most however head for milder climates. Migration patterns are being studied to find out where they go. Bird banders have been keeping records for a number of years to document these patterns.